Buying and selling? They’ve always been social activities. Back in the dark ages – before our lives were lit by a thousand screens full of Facebook, Twitter, and well, every other glowing corner of the internet – people still asked other people for buying advice, gossiping about gramophone brands over the garden fence. And they still wrote stinging letters to manufacturers when their products let them down and scratched their brand new 78s. The difference here in the 21st century? Blogs, forums and social networks have replaced the humble garden fence, and everyone is everyone’s digital neighbour. What’s more, voices carry; bitter complaints – whether they’re justified or not – can be public, and rapidly searchable. Just take a moment to trawl Twitter for #BadService if you're not convinced. The result has been more powerful, more connected customers. This has resulted in more customer-centric companies that understand the value of incredible customer experiences. The same advances which have transformed buying, and empowered smart buyers, are now also transforming selling – and offering huge advantages to the socially-savvy. 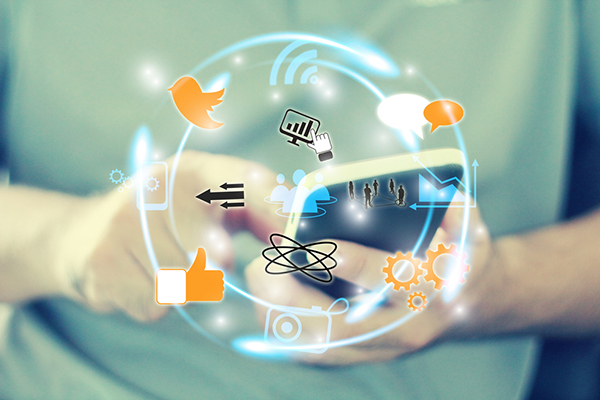 Social selling is a lead-generation technique grounded in social media. It allows salespeople to directly interact with their prospects on various social media platforms. By challenging the norm of how sales “happens”, salespeople, customer service agents, and even marketers can now reach out to customers through their preferred social platforms. The success behind social selling rests in the bedrock of the community network and the trust that is built off the back of it. Right now, there are buyers the world over who want what you’ve got to sell. They have a need, they have a timeframe for purchase, they even have budget. If only you could get in front of them, they’d buy from you right now. If only. Of course, to get in front of them you need to find out who they are, where they are and how to contact them. Traditionally, this has been anything but easy. Fortunately, in our online socially connected world, this has now become simpler than ever before. When social media first blipped importantly onto every business’s radar, marketers quickly saw the value. Before long, most organisations were busily broadcasting on social channels in an attempt to load the sales funnel at the top end. Today, however, winning organisations are increasingly using social tools throughout the sale. Whether you’re leveraging your professional network on LinkedIn for sales prospecting or building your Twitter following to build up relationships within the industry you’re selling to, social selling is a powerful tool to have in your sales arsenal. Modern social selling isn’t complex, and (mostly) it doesn’t require any specialist skills. But it does require a different way of thinking about the sales process. In 2015, there were reports that only 1 in 4 sales reps knew how to integrate social media into their sales process. Yet, 61% of organisations engaged in social selling report a positive impact on revenue growth. Now let’s dig into a few how-to’s for social selling so you can become one of those 1 in 4 reps who know how to leverage social. Remember the age-old challenge of finding the people who really need your stuff? Now, they may well be discussing their needs online – posting comments on forums, asking their followers on Twitter, and updating their status on LinkedIn. You just need to be listening. Tools such as Tweetdeck and Google Alerts, not to mention our own Sales Cloud Contact Management and Marketing Cloud Social Studio, can offer insight into what your customers are discussing online. Right now. Put them to good use, and you’ll be able to understand individual customer needs, and broader market trends – stepping in to offer targeted, perfectly-timed advice. James is a head of sales. He works for a company that sells business consulting to professional services firms. He’s been working there since the day before his daughter started at school, right up till today, when he’ll spend the evening glaring at her first potential boyfriend. From hard won experience, he knows that firms buy from his business when they face significant changes – like sudden expansion or contraction, a merger or consolidation. James, like most fathers to modern teenagers, is socially savvy. He’s able to set up a series of ongoing searches to look for trigger phrases in social media. He follows key target companies on LinkedIn, and looks for new job postings and breaking news. And he comments on industry blogs whenever he has insight to offer. The result? James is far more likely to be in the right place at the right time when a sales opportunity does come up. Even better, he’s already hooked into the conversation, and demonstrating value – a huge head-start over his competitors. It doesn’t take him long to set up those searches, and offer up a first few words of wisdom. He’s able to get started in social selling in no time, leaving him free to spend the evening terrifying his future son-in-law. We use Facebook and Twitter to keep ahead of what our customers and prospects are saying, and to spot those who need service and sales help. We run our own Social Media Command Centre. (It’s just as important as it sounds.) We utilise Social Studio – our own social media monitoring, analysis and engagement platform – to continuously monitor what people are saying about our brand. It enables us to reply with comments, record sentiment (both good and bad) and try to help wherever we can, including flagging issues for other members of our team to follow up. We flow what we learn into our Sales Cloud CRM, creating a social customer profile. Sales Cloud allows us to capture everything from Twitter handles, tweets, and LinkedIn profile pictures, to details of user/customer connections – plus anything that’s ‘public’ on Facebook. We treat ourselves to a guilt-free coffee break, safe in the knowledge we’ve a single, multi-dimensional view of each customer, and that it’s available to anyone involved in sales. When a sales opportunity is identified, we use Chatter, our employee social network, to help us leap into action – marshalling resources, and keeping everyone up to date. You may be pitching the best product or service around, but that’s no guarantee you’ll win the business. Sales success depends on insight, and – even harder to quantify – empathy. That’s why every good salesperson researches their prospects prior to making contact. Before social media, this could be tough. The best a sales person could do was check out the company’s website, wade through their annual report, and check for mentions on trade websites. But too often, they’d feel like they were merely skimming the surface – with little hope of gaining the deep insight into a prospect’s needs that it takes to really tailor a pitch. Armed with this information, it’s a lot easier to put together an insightful, emotive sales pitch – one that’s less ‘me, me, me’ and more ‘you, you, you’. Salespeople can show how products and services directly solve the issues their prospect is facing, even issues that the prospect has yet to wise up to themselves. And they’ll have a far clearer picture of whose buy-in is critical in making the sale. Some sales are gloriously simple. A customer comes onto your site or into your store, they choose a book, a sandwich, or item of clothing, check out – and you’re done. Most sales, however, are much more complex. If you sell high value items – cars, houses, fitted kitchens – or sell to other businesses, the chances are your sales take time, and involve multiple interactions. Such complex sales can also involve any number of people. There may be multiple buyers, each with their own role to play – and needs to be met, if you’re to secure their signature. You might need to involve a lot of minds on your side too, as you gather the expertise and knowledge necessary to build a compelling case. Here again, getting more social has much to recommend it. Social collaboration tools can connect salespeople with in-house experts quickly and easily, letting them ask questions, publish insights and create documents on the fly. Which means you can bring the full weight of your organisation’s expertise to bear when making a sale. They also offer a simple way to keep every team member in the loop; salespeople can ‘socialise’ an opportunity, letting people follow it in real time, and gain instant status updates to their desktop. In sales, getting the drop on the competition can be the difference between a monumental deal and a crushing disappointment. And increasingly, you don’t need to wait for your rivals to take out a banner ad to discover their latest play. Let’s face it, major initiatives are generally the result of months of planning. Months in which core themes will be trailed in presentations and conference speeches, and may even be discreetly tested on chosen segments of the market. Social tools can help provide advance notice of such significant shifts in positioning. They can help you monitor what your competitors are saying – and crucially, what individuals within their company are saying, and the responses they’re receiving – letting you spot competitive movement earlier, and react faster. On average, companies lose half their customers every five years. But your company can do a lot to pull that average in the right direction. Very few customers leave on a whim – after all, moving your business to another supplier costs a heap of time and money. Typically, any loss (especially in B2B sales) will be marked by weeks or months of debate about what’s going wrong, as well as extensive research into the other options available. At one time, this activity might have reached you as gossip and rumour – nothing a supplier could act upon with any degree of certainty. Now, however, everything is a lot more public. You just need to know where to look. Peer recommendations have always been the trusted source of information for any business decision. But today, the definition of ‘peer’ has widened considerably. It’s no longer simply those we work with, or have worked with in the past (though the influence of this group has grown exponentially with the likes of LinkedIn and Xing). Today, our peers include a vast range of people, connected in a wide variety of ways. Social networks glue these connections together. They make it easier than ever for people to share information, and solicit recommendations about services and suppliers. And – here’s the kicker – they’re public. Social tools don’t just help you monitor the competition. They show you what your customers are doing and saying too, offering precious insights into issues you’d fail to spot by any other means. Proactively address those issues, and you stand to save both you and the customer a costly break-up. Social CRM – such as the social connectors for our own Sales Cloud. Social CRM helps you get through to the right person, pre-armed with the right information. Social Monitoring – if you want to spot relevant social activities, some form of social monitoring is essential. Social collaboration tools – how do you ensure everyone can contribute to a sale, at the crucial moment? There’s never been a better time to embrace social selling tools – to find new customers, craft pitches to meet their deepest needs, and bring the right people together to make the sale. We hope you’ve found this mini-guide useful. Ready to take a deeper dive into social selling? 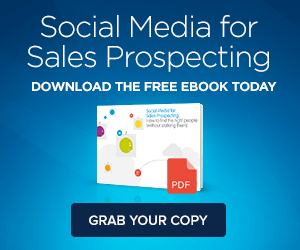 Check out our e-book, Social Media for Sales Prospecting.